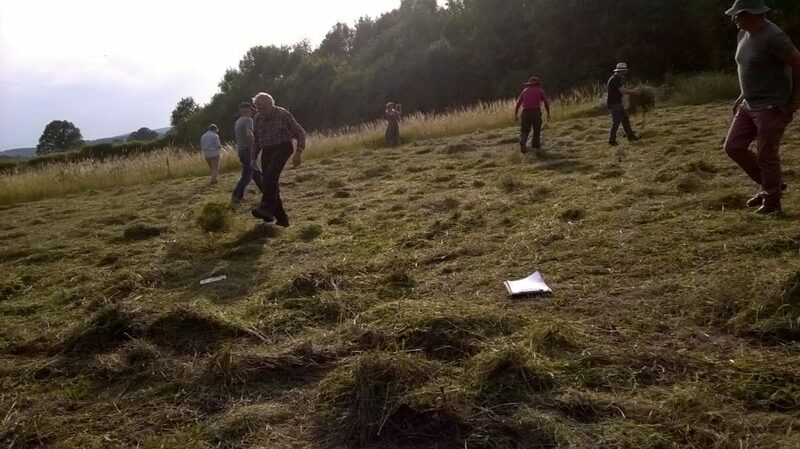 Herefordshire Meadows members helped Tony Norman of The Leen, Pembridge spread green hay from Moseley Common SSSI on a small adjacent improved ryegrass / clover ley in summer 2017. This was a challenging site that has been part of the dairy grazing rotation for years and the ground was also very dry and hard to harrow. 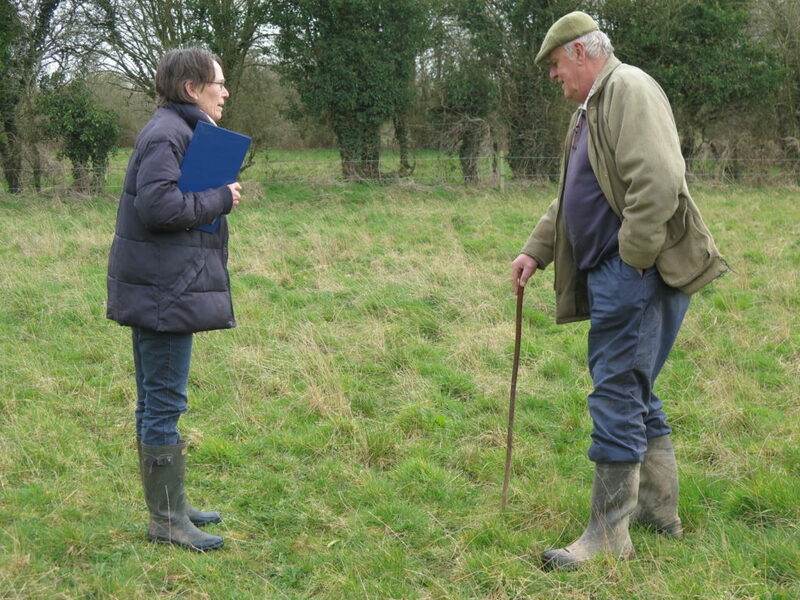 But we can report that almost 2 years later there is a good mix of finer grasses and broadleaved plants establishing and Tony has plans to control the remaining vigorous ryegrass plants in the field. Other flowering plants are likely to establish in the coming years with patience and a further enhancement with hay from the species rich field next door might help to speed this process. Tony Norman delighted that Sue found cat’s ear, knapweed, sorrel, ribwort plantain, red clover, ladies smock and finer grasses already establishing in this meadow. March 2019. Doubtless more flowers will appear as the season progresses. 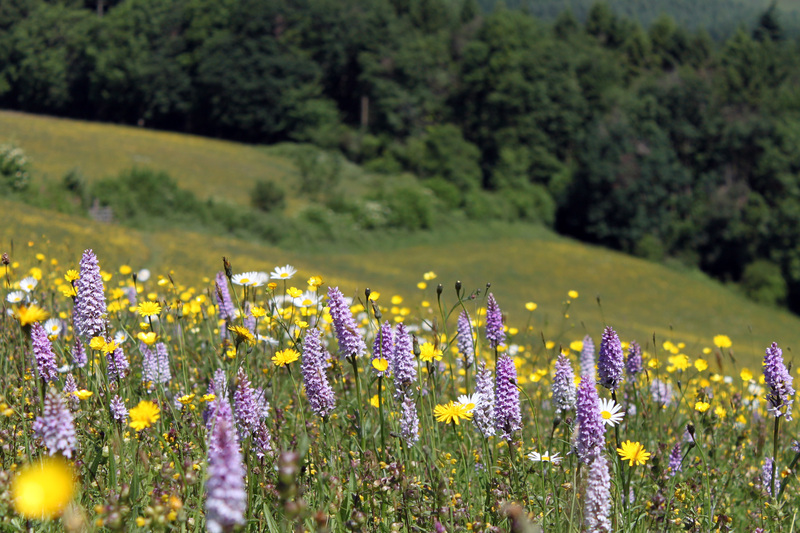 For more information about how to restore or create a meadow type key words such as “meadow restoration creation” into the search box of this website.